Designed as a true test of the symbiotic union of organic forms and mechanical function, each of the 161 custom pieces of the Armadillo:161 are individually 5 and 9 axis machined from G5 titanium billet block. The process of creation requires well over 400 machine-hours to complete a single assembly. Each link is comprised of 8 separate custom machined pieces, individually serial numbered and paint-filled. The off set angled clasp has a captured thumbscrew that allows for extremely easy one-handed operation. The secondary thumb-screws integrated into the clasp are mini-wrenches used to adjust the bracelet and remove links. 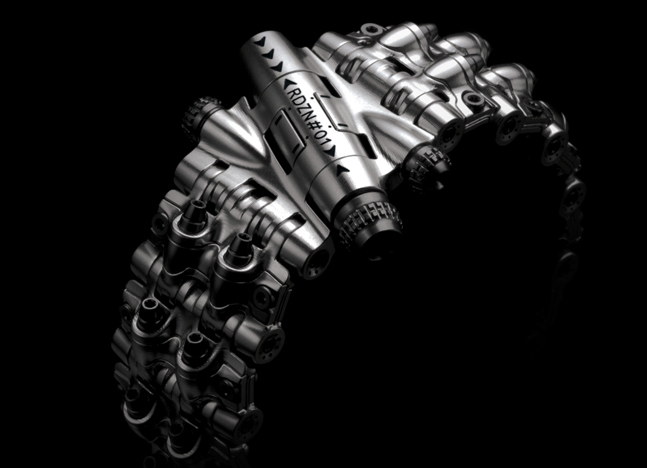 The first edition Armadillo:161 bracelet is a special signature edition with the designer's signature appearing on every link axel and the barrel of the clasp thumb-screw. This signature edition will be limited to 5 pieces sold worldwide. The Armadillo:161 has a suicide number of 5.